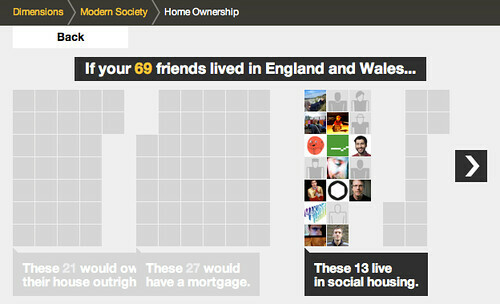 Back in 2009, we started the work that would become http://howbigreally.com and http://howmanyreally.com with the BBC, releasing those two prototypes over the last two years under the banner of “BBC Dimensions“. Our intention from the beginning was to design the service as a module that could be integrated into bbc.co.uk at a later date if they proved successful with audiences. Earlier this year, Alice worked with the engineers at BBC News to do just that, and now the first BBC News stories featuring the “How Big Really” module are starting to appear. 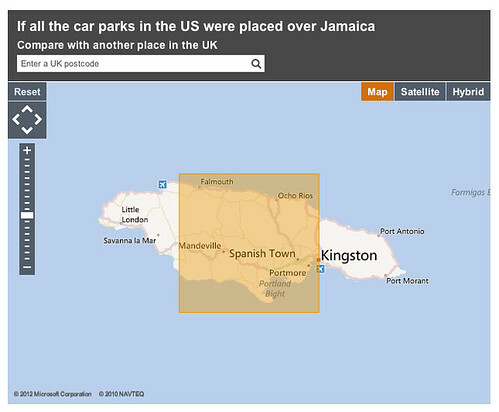 Here are a couple of examples – a story on the vast amount of space given over to car parking in the world, illustrated with the module juxtaposing the total space used by parked cars over the island of Jamaica! 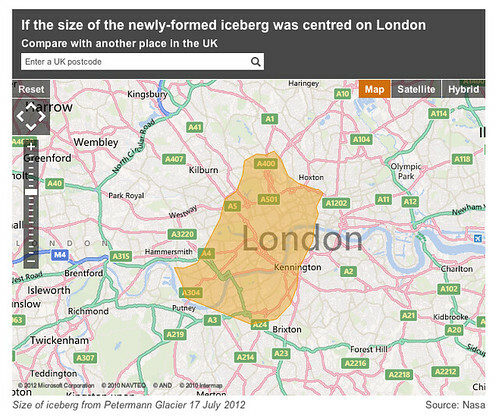 …and a more recent example showing the size of a vast iceberg that has just broken free of a glacier on Greenland. 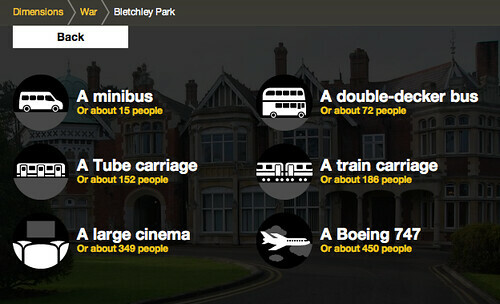 Of course, as with the original http://howbigreally.com prototype, you can customise the juxtaposition with the post-code of somewhere you’re familiar with – like your home, school or office. The team worked hard to integrate the prototype’s technology with BBC News’s mapping systems and the the look/feel of the site overall. 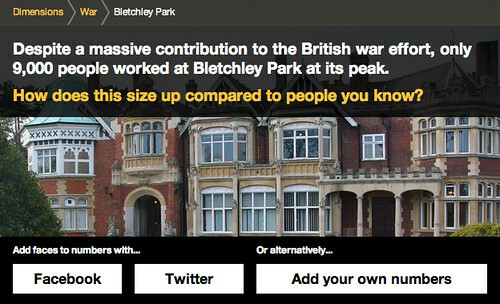 We worked with the BBC Maps team to create a tool that could be used by editors, journalists and developers to create How Big Really style maps. Chris Henden and Takako Tucker from the team supplied me with the BBC Maps Toolkit and did a great job of explaining some of its more nuanced points, particularly when I got into trouble around Mapping Projections. 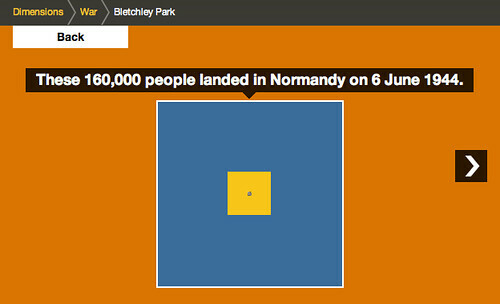 The tool takes an SVG representation of an area, including a scale element, converts it to a JSON object that is then rendered onto a map using the BBC Maps Toolkit. Immediate feedback allows the map creator to check their SVG is correct, and the JSON representation of the shape can then be used to build the map in future. It’s really satisfying for us to see something that started as a conceptual prototype back in 2009 find it’s way into a daily media production system of the scale and reach of BBC News. Thanks to all the team there – also Chris Sizemore, Lisa Sargood and Max Gadney for shepherding the project from whiteboard sketches to become part of the BBC journalist’s digital toolkit. Our friend Will Wiles, erstwhile deputy editor of Icon and author of “Care of wooden floors” unearthed this brilliant vintage visualisation: the scale of the Golden Gate Bridge overlaid on central London. 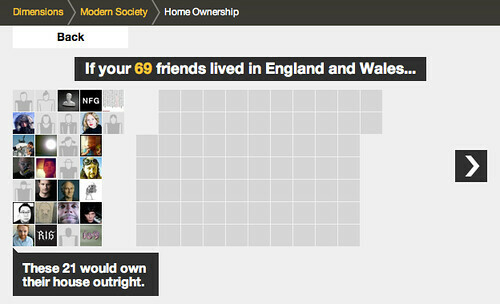 It really is HowBigReally.com 70 years earlier! 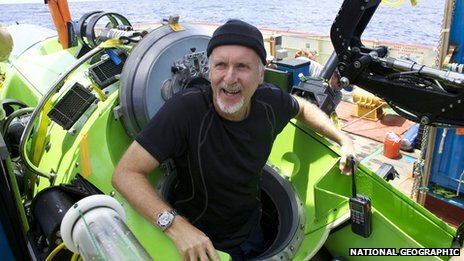 Hearty congratulations to James Cameron on reaching the bottom of the ocean at the Marianas Trench. Enter your postcode and get an idea of how far the bottom of the Marianas Trench is from where you live… or even better, calculate a route to take a walk that’s the same distance as James Cameron travelled in his submersible! How big really is now just over a year old, released just before I started work at BERG, and I still find myself totally engaged with the simplicity of the concept. It’s a solid, easy to digest punch of information that translates unknown quantities into something instantly recognisable. How many really is the second part of the experiment, and I was tasked with working on the design. This is a little write up of the design process. We started off by following a workshop Webb & Jones had run with the BBC to kick off the initial concept of examining quantity. Myself, James Darling & Matt Brown spent a week whiteboarding, sketching and iterating, to try and nail down some initial ideas. The first thought was the variables with which we could use to convey changes in quantity. Time, movement, zoom & scale were all identified as being potentially useful. We started to construct sentences that could tell a story, and break down into portions to allow new stories to slot in. Looking at splitting grids into sections to show different variables. We thought a bit about avatars, and how to use them in visual representations of data, in this case combining them with friends’ names and stories. Looking at combining avatars with ‘bodies’. Bird suits, vehicles, polaroids. 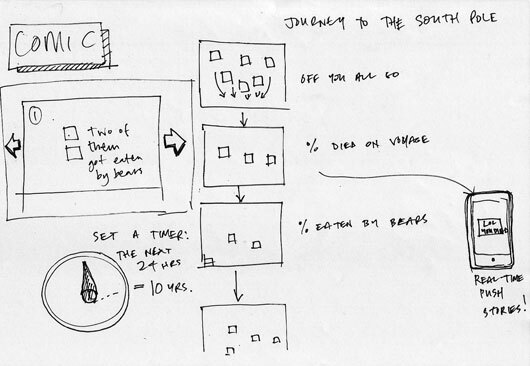 An early narrative concept, setting up the story early on and sending you through a process of experience. 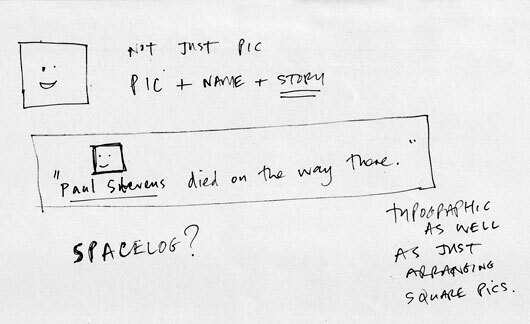 We thought about pushing bits of stories to devices in real time. Grouping / snapping – used to take your contacts and run them through a set of statistics, applying them personally to historical events and comparing them against similar events in different times. What became clear after the sketching was the need to show a breadcrumb trail of information, to give the user a real sense of their scale compared to the numbers we were looking at. 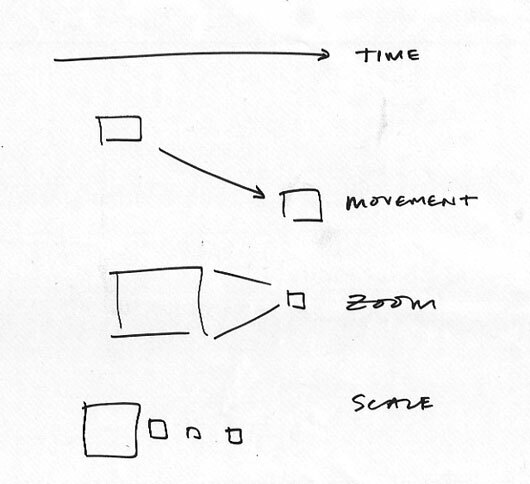 Eames’ Powers of 10 video achieves this – a set of steps, with consistent visual comparisons between each step. Perfect for showing the relevance of one thing in relation to the next, or a larger collective group. But the variation in the stories we’d be showing meant that we didn’t want bespoke graphics for each individual scenario. We tested out a quick mockup in illustrator using relatively sized, solid colour squares. Despite the lack of rich textures and no visual indicators of your current position in the story, the impact was there. 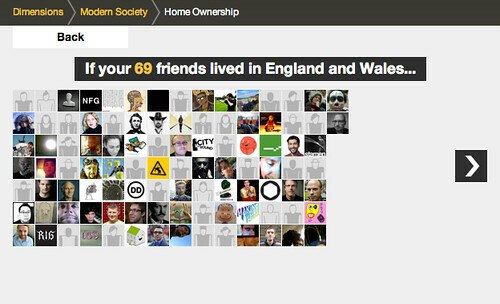 We added Facebook / Twitter avatars for signed in states, and worked on a colour palette that would sit well with BBC branding. The next problem was dealing with non-signed in states. How many really was always designed to work with social networks, but we wanted it to be just as relevant with no Facebook or Twitter credentials – for classrooms, for example. We took a trip to the V&A to view the Isotype exhibition that was on at the time. 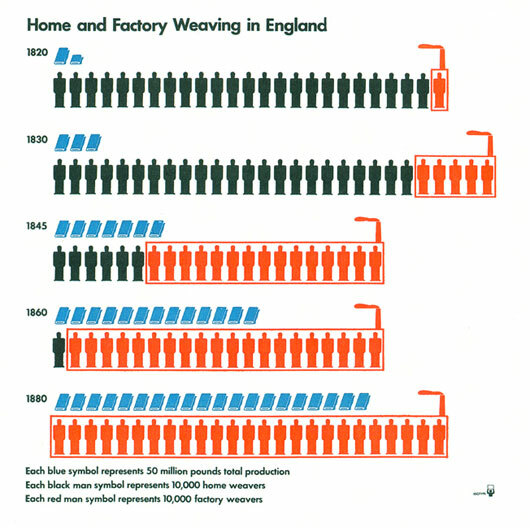 That’s 85 year old iconography and infographic design that looks as relevant today as it did back then. 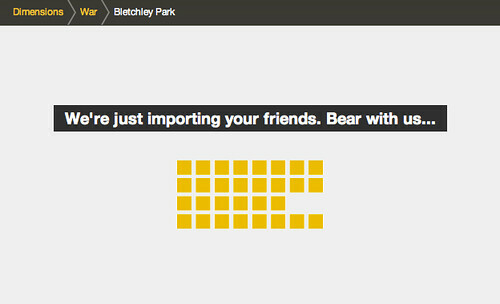 A real sense of quantity through simple pictograms. Completely fantastic. We set about designing a stack of isotype influenced icons to work with the site when users weren’t signed into their social networks. 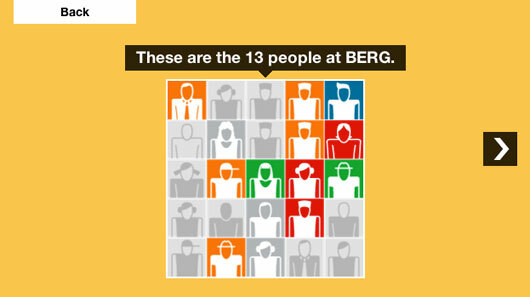 We used a bit of Isotype inspiration for the organisation of the grouping stories – evenly spaced grids of icons or avatars. The rest of the site was intended to stay consistent with How big really. We used photography in place of bespoke graphics for the story panels, as the graphical output varies for each user. 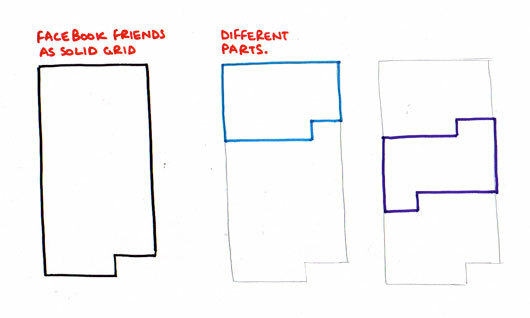 How many really is an entirely different beast to How big really. Rather than each dimension being a solid, one shot hit, the value is in backing up simple visuals with interesting narratives. We spent almost as much time on the written aspect of stories as we did on the aesthetics and interaction. I hope it gives a little context to numbers and figures we often take for granted. Please do have a browse around! 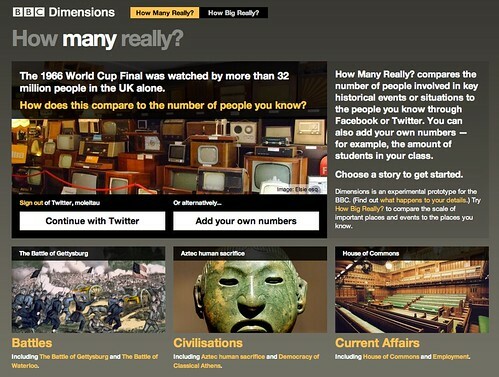 BBC Dimensions: How Many Really? 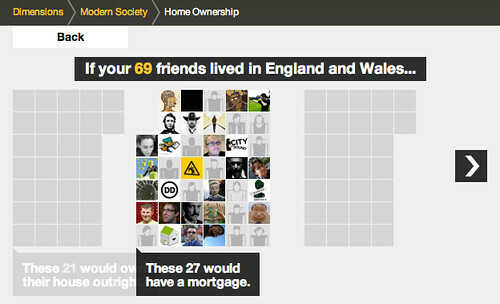 Update, February 2013: Howmanyreally.com has now finished its prototype trial, and is no longer live. About two years ago, we started work with Max Gadney on a series of workshops looking at how digital media could be used for relating stories and facts from both history and current affairs. One of the concepts was called ‘Dimensions’ – a set of tools that looked to juxtapose the size of things from history and the news with things you are familiar with – bringing them home to you. 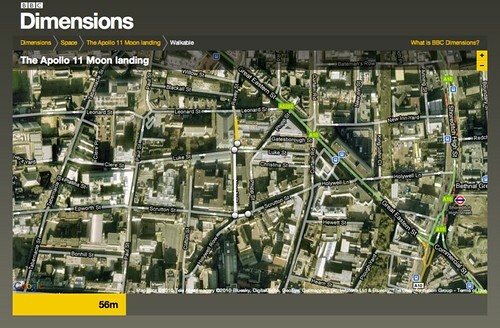 About a year ago, we launched the first public prototype from that thinking, http://howbigreally.com, which overlaid the physical dimensions of news events such as the 2010 Pakistan Floods, or historic events such as the Apollo 11 moonwalks on where you lived or somewhere you were familiar with. It was a simple idea that proved pretty effective, with over half-a-million visitors in the past year, and a place in the MoMA Talk To Me exhibition. You can probably guess what it does from the URL – it compares the numbers of people who experienced an event with a number you can relate to: the size of your social network. 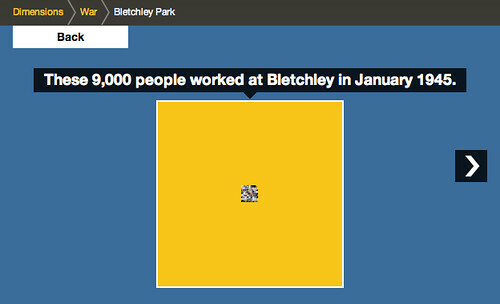 Zooming out again places that group in relation to those working at Bletchley Park in 1945. Despite the difference between the size of the final group and your social network, it can still just be made out at the centre of the diagram, helping us imagine the size of the group involved in these efforts during World War 2. Of course this visualisation owes much to the pioneering work of the Office of Charles & Ray Eames – particularly their “Powers of 10” exploration of relative scale, which is a shared source of inspiration in the studio. 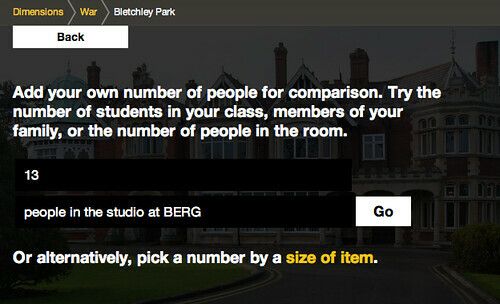 There is another type of comparison featured in the prototype – one which during development we likened to an assembly in a school playground – where your friends are gathered into different groups. 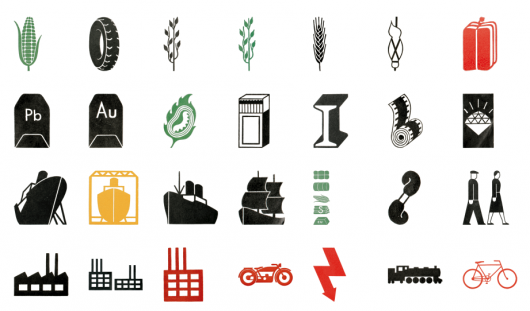 There are a lot of influences on howmanyreally – both from the Eames, and in the case above – the work of Isotype, which I hope we’ll go into in a further post. 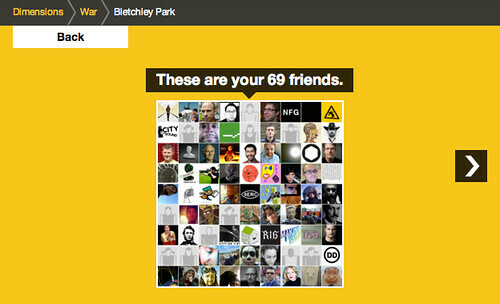 But for now let me encourage you to explore howmanyreally.com yourself. It’s little bit of a different animal from its sibling IMHO, which had such an immediate visual punch. This is a slower burn, but in my experience playing with it, I’ve found it can be just as powerful. Both human history and current affairs unfortunately feature an high percentage of turmoil and tragedy. While I’ve selected some rather neutral examples here, juxtaposing your friends with numbers of those injured, enslaved or killed through events in the past can really give one pause. 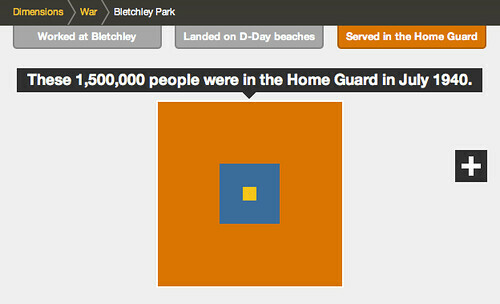 In its way, I’ve found howmanyreally.com a tool for reflection on history. A small piece that I can loosely join to a larger exploration of the facts. I really hope that’s your experience too. 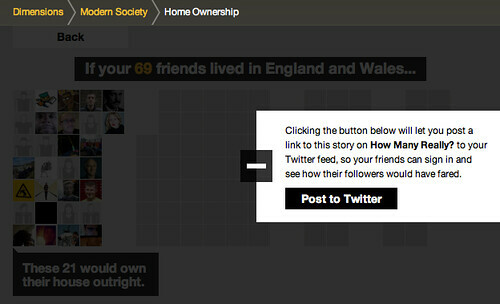 If you don’t wish to use your social network accounts in connection with howmanyreally, you can enter a number you’re familiar with to centre the comparison on – for instance the size of a school class, or those in your office perhaps. 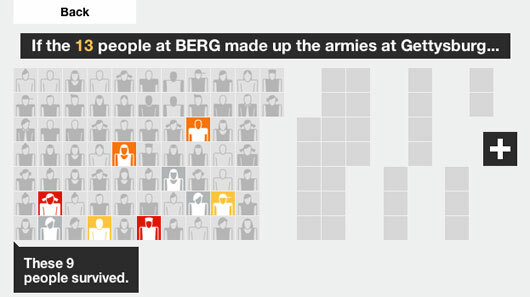 As with howbigreally.com – if the prototype is successful, these new visualisations are designed to be incorporated as an element within the bbc.co.uk history and news sites. 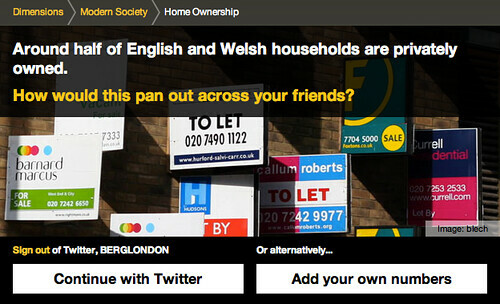 So do give your feedback to the BBC team through the contact details on the site. It’s just left to me to say thanks to the team at the BBC who originally commissioned these explorations into history at human scale, including Lisa Sargood, Chris Sizemore, and Max Gadney. Howmanyreally (and Dimensions as a whole) has been a fascinating and rewarding piece to work on, and thanks many members of the studio who have made it happen: Nick Ludlam, Simon Pearson, Matt Webb, Denise Wilton – and the core team behind its genesis, design and development: Alex Jarvis, James Darling, Peter Harmer and Tom Stuart. About a year ago we did some workshops with the BBC, to look at new ways in which history could be explored and explained using digital media. We came up with 30 or so ideas which got narrowed down to 5 ‘microbriefs’ for possible future prototyping. One of our favourites from the off was an idea we called “Dimensions”. 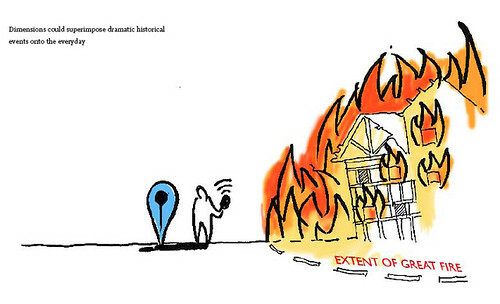 “We want to bring home the human scale of events and places in history. 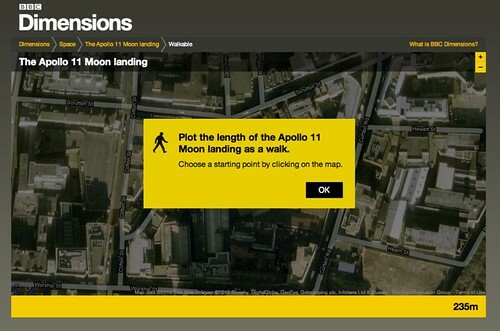 The Apollo 11 Moon walk explored an area smaller than Trafalgar Square; the distance between your WW1 trench and the enemy could only be as much as from your front door to the street corner. 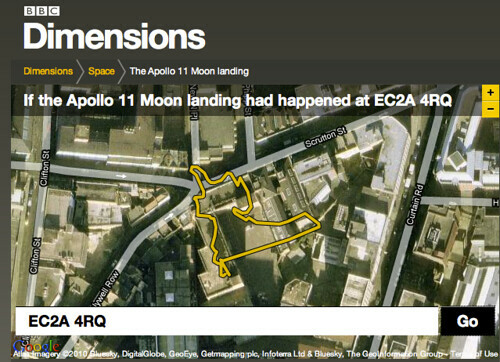 Earlier this year we began to design and build a public prototype of the BBC Dimensions concept which we’re putting live today. 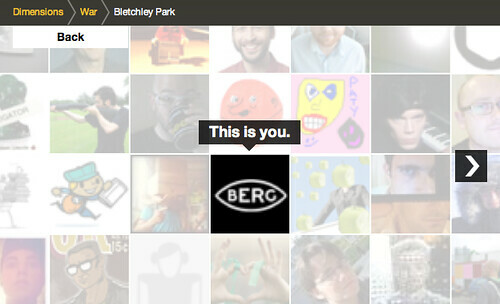 It lives at http://howbigreally.com and it’ll be available as a trial for the next few months. Let me give you a little tour. 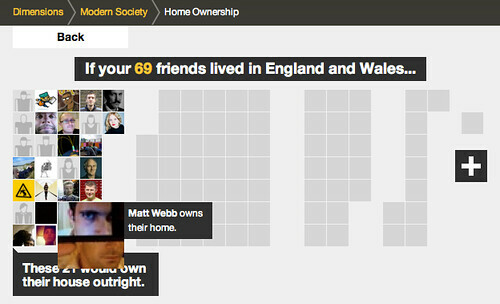 You can have a play right there and then by entering your postcode or a place name. 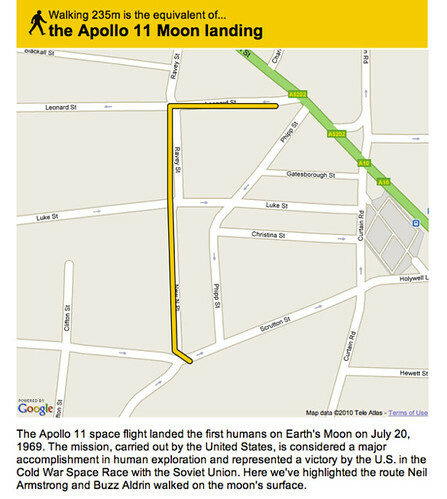 It understands most things that google maps understands. We’ve built the prototype using google maps, but there’s no reason why it couldn’t work on top of another mapping system eventually. 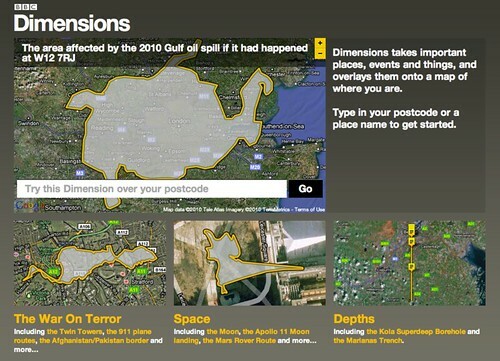 As we were building the prototype, the BP Deepwater Horizon oil-spill disaster occurred, and you might have seen the excellent visualisation at http://www.ifitwasmyhome.com/ by Andy Lintner. When we saw that and how well it was received – we knew we were on the right track! 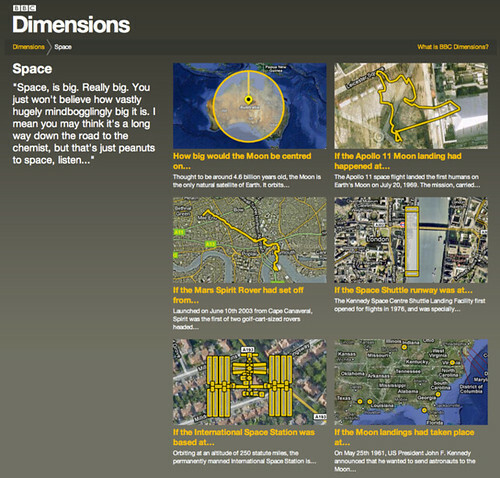 Dimensions is a platform to explore a lot more in that vein. Wandering into the ‘Space’ package reveals a few different types of dimension – sizes, plans, routes. Some Dimensions let you go a step further, literally – by allowing you to plot a route around your neighbourhood, or perhaps your commute, or perhaps a nearby bit of countryside – so that you can viscerally experience the distances involved. …and when you’re happy with your route you can print out a map to take on your dimensional ramble. The distance just about takes us from the front-door of our studio to a refreshing pint in one of our locals, The Book Club. Just the thing after a moonwalk. One of the things I love about it is things like that – where something huge and momentous is made grokkable in the familiar. I also love that that’s all it really does. It’s a bit like a digital toy – that just does one thing, very clearly (we hope) and delights in doing so. 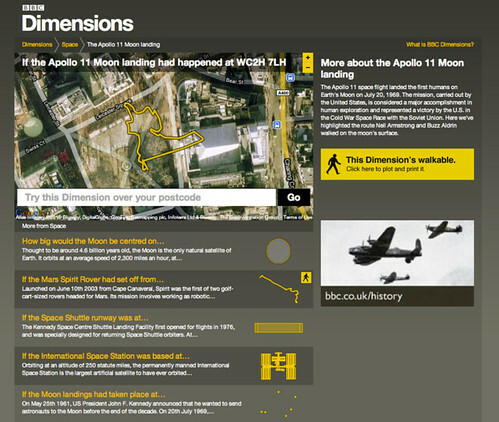 It’s imagined that if the prototype is successful, it will be integrated into the main BBC site for embedding into history and news storytelling online. The prototype system that we’ve made allows designers and producers at the BBC to create as many Dimensions as they want to using standard SVG creation tools. It’s also possible that this system could be opened up for local history enthusiasts to create their own dimensions to contribute. The BBC worked with KeltieCochrane to create the initial content that’s in this prototype, and it was fantastic to see the system we built fill up with their work. My favourite’s The Colossus of Rhodes. Brilliant. We’ll write some more here about both possible futures and the behind-the-scenes of Dimensions later. In the mean-time, many thanks to Matt Brown, Tom Armitage, Matt Webb, Phil Gyford and Paul Mison who worked on this with me, and Max Gadney for giving us a lovely brief. Alan Kay once said that “A change of perspective is worth +80 IQ points”– that’s the goal of BBC Dimensions. So long as it delivers tiny bursts of that along with the little grins of ah-ha it seems to generate, we’ll be very happy. One bit of consultancy we’ve done recently has been on new programme formats for mobile devices. It was a bit of a dash–just a few days thinking and writing, and a week to pull together communication material. The brief was set by the BBC, and there was a progressive clause in the contract: S&W do the thinking, produce communication material and present to the project team there; the BBC can use any of the ideas without restriction, but we retain copyright on the report itself. So while I could, in theory, copy and paste the report into this blog, it seems fairer to let the folks have a good run at developing the programme ideas themselves. I’ll talk a little about our approach and the deliverables instead. The brief was this: what would successful programmes broadcast to mobile devices be? Put aside, for the moment, interactivity and on-demand programming. It seems to us that successful programming has to acknowledge three factors: the technological constraints, possibilities and expectations of the medium; the interests of the audience, and; the situation in which the programming and audience meet. TV and radio have long histories as media and are well understood. For TV, the audience varies and so we have different channels to cater for demographics and interest (the situation is more-or-less fixed, though there are different TV channels for certain situations like gyms and bars). 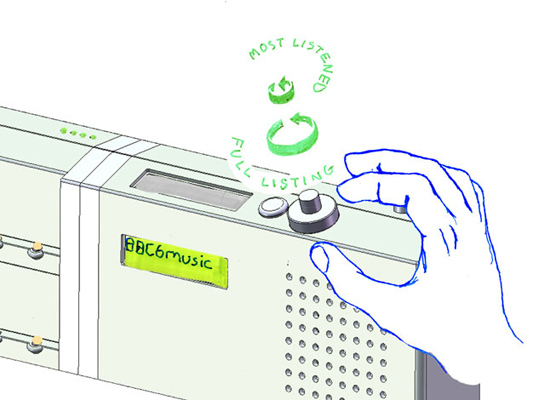 The situation of radio varies more, but again different stations cater for focused and backgrounded listening. And of course, programming content varies over the day for both TV and radio–whether it’s late night or mid afternoon is a great predictor of the audience and its constraints. Programming for mobile devices, on the other hand, will land in unpredictable and highly variable situations… it’s a huge factor compared to the variability of the audience (and we can forget the constraints of the medium, for the moment, given it’s too new to have historical momentum). We focused on finding a way to talk about the experience of different situations. Mobility. Can the viewer/listener devote 30 minutes to this programme, or are they grabbing a few minutes that could end at any moment? That is: can they sit, or must they move? Attention. Must the viewer/listener background the programme because the situation demands attention, or can they concentrate? attention (but the viewer can control their movement): like being at work. nothing (the viewer can concentrate, and control their movement): home. mobility and attention: it’s like being out shopping. just mobility (but the viewer can concentrate on something else): on the bus. Given that – and the technological possibilities of the medium – we can take basic programme ideas and coerce them into being particularly good for the common audience situations, rather than just so-so. Other factors come into play too, of course. Mobile devices – in particular mobile phones – are very intimate devices. We did some experiments with video and found the full face, straight to camera pieces were significantly better for these devices than presenters talking from behind a desk (Ze Frank‘s natural medium, perhaps). Oh, and the way people use their phones when they’re killing time… there’s some fascinating research there too. But anyway, I don’t want to say much more. Just that frameworks like these aren’t a replacement for inspiration and thinking… it’s important to take them with a pinch of salt and be ready to discard them. What a framework is good for is as an explanatory tool, communicating the rationale of a nuanced concept through an organisation so that it can be developed and not reduced as it gets passed on. Usually for this kind of consultancy we develop a slide deck in workshops with the client, or turn up and present. 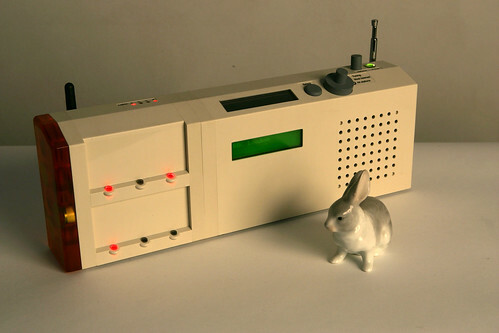 Since these programme concepts needed to transmit through the BBC, a different form was called for. The image at the beginning of this post is of two of the three posters we delivered (each A2: 16.5 x 23.4 inches). 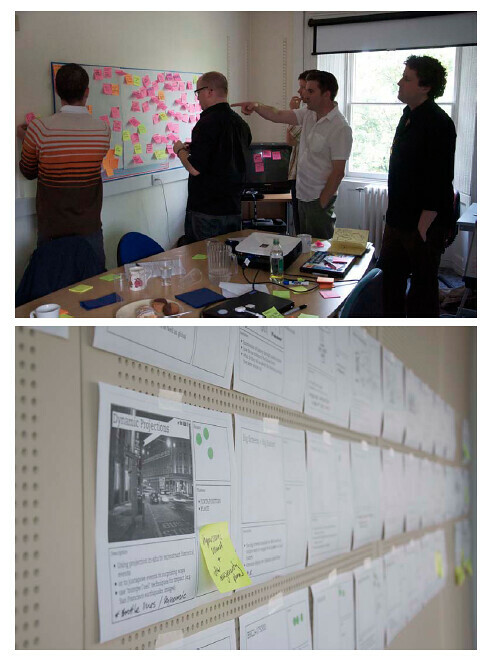 On the left, the poster discusses the background to the project, frameworks, and how the ideas could develop with interactivity and location awareness in the future. The poster on the right presents news and three other programme concepts (including a development of Ambient EastEnders). Below is the third poster. 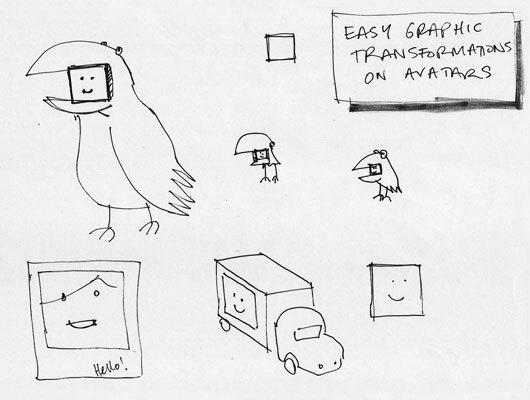 It presents three more concepts, and some thoughts about successful forms of mobile video. All three look pretty tremendous printed large. Producing posters was an experiment for us–successful, I think. We were pleased to work with Alex Jarvis, who brought to bear his exceptional talent on the graphic design and illustration. Plus we got to explore the idea of a poster as a kind of zooming user interface, where there are a series of self-similar levels of detail that progressively reveal as you move closer to the paper. So when you stand across the room, half the paper is legible with a title and a huge graphic. Moving closer, half of the rest (a quarter) become legible with a subtitle for the main segment and more concept titles. At the closest level of reading, the poster functions as a page of broadsheet. The next time around I’d like to investigate that more. I’d like to thank Dan Pike and the project team at the BBC for choosing to bring us in to work on this, and for their open approach. I look forward to seeing where the concepts are taken in the future!